New technologies that allow us to investigate mechanisms and functions of the brain have shown considerable promise in treating brain disease and injury. These emerging technologies also provide a means to assess and manipulate human consciousness, cognitions, emotions, and behaviors, bringing with them the potential to transform society. 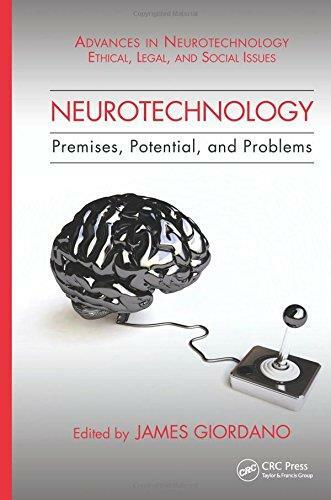 Neurotechnology: Premises, Potential, and Problems explores the technical, moral, legal, and sociopolitical issues that arise in and from today’s applications of neuroscience and technology and discusses their implications for the future. Some of the issues raised in this thought-provoking volume include: Neurotechnology in education: an enablement, a treatment, or an enhancement? The potential and limitations of neuroimaging technology in determining patient prognoses Tissue implantation technology as a way of engendering personalized medicine Neuroprostheses: restoration of functions of the disabled vs. enhancement to transhuman capabilities Deep brain stimulation and its use in restoring, preserving, or changing patients’ personal identity The benefit and risk of cognitive performance tools Cyborg technology and its potential to change our vision of humanity Methodologies for reducing the risk of neurotechnology’s impact on ethical, legal, and social issues With contributions from an international group of experts working on the cutting edge of neurotechnology, this volume lays the groundwork to appreciate the ethical, legal, and social aspects of the science in ways that keep pace with this rapidly progressing field.